Your first marathon, so everyone tells me, should be on a nice easy flat course in the cool months of the year. Sporting a naive enthusiasm last seen when Scott departed for the Antarctic, I signed up for the complete opposite: The Wales Marathon, in Tenby, Pembrokshire. The Wales Marathon forms the final event of the Long Course Weekend, a key event in the triathlon calendar. Set over three days, the full long course participants swim 2.4 miles on Friday, cycle 118 miles Saturday and finally run 26.2 miles on Sunday. 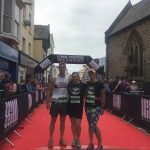 The swim and cycle legs follow the same course as the notoriously tough Ironman Wales course, so many participants in the LCW use this event as a preparation and training weekend for the Ironman to get to know the course. So what does this tell you about the type of people who run this marathon? Well, they’re fierce. And they’re fit. Like really, really fit. They’re the kind of people who shave their body hair for speed and have bicycles that are worth more than your car. They are not a nearing middle-age mum of a toddler who’s still trying to get her fitness back. They are definitely not first-time marathoners. 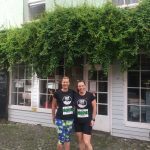 I was a little oblivious to this fact when I first signed up, but as time went on I would inevitably have the same reaction to my quest from more experienced runners – what on earth are you thinking? Shaved Adonis’ on expensive road bikes aside, this reaction was due mostly to the course. 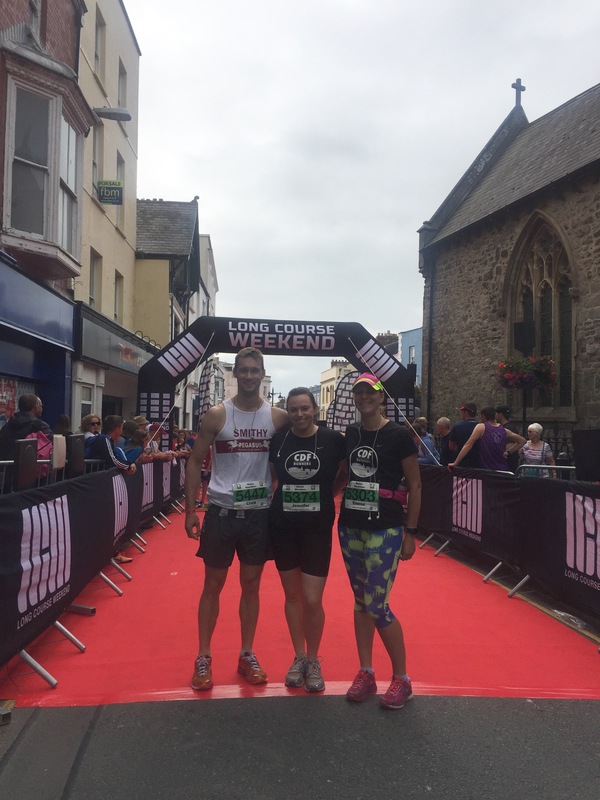 The marathon course for the LCW differs from that used for the Ironman, in that rather than a four lap course of Tenby (the insanity! 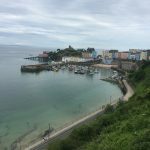 ), you run from Tenby to Pembroke, via the beautiful countryside of Pembrokeshire, before turning around and heading back to Tenby through more beautiful countryside and some coastal vistas thrown in for good measure. So far, so pretty. But Pembrokeshire isn’t known for its flat countryside, the route is hilly and rolling throughout. 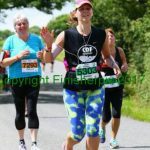 26.2 miles of undulating countryside. No worries, right? I carried on my training, only occasionally deterred by looks of pain from fellow runners when I told them what my first marathon was to be. Sunday 9th July arrived; race day! I awoke to my alarm and following a bowl of bircher muesli and raspberries, then feeding, dressing and wrangling a nineteen month old into a car seat who doesn’t want to get in there, we were off into Tenby bright and early to secure a parking spot. The day seemed overcast, with a little misty rain; the air was feeling quite humid though. Myself, my husband Simon and my son Joshua had all been into Tenby the night before to watch the last of the cycling competitors arrive, marvel at the spectacle of the finish and look in awe at the hundreds of expensive bikes left unlocked about the town, leaning precariously against walls and balanced on planters as their owners sank a congratulatory pint in the pub. So I was feeling pretty calm and collected to begin with, but my nervousness slowly started to build. 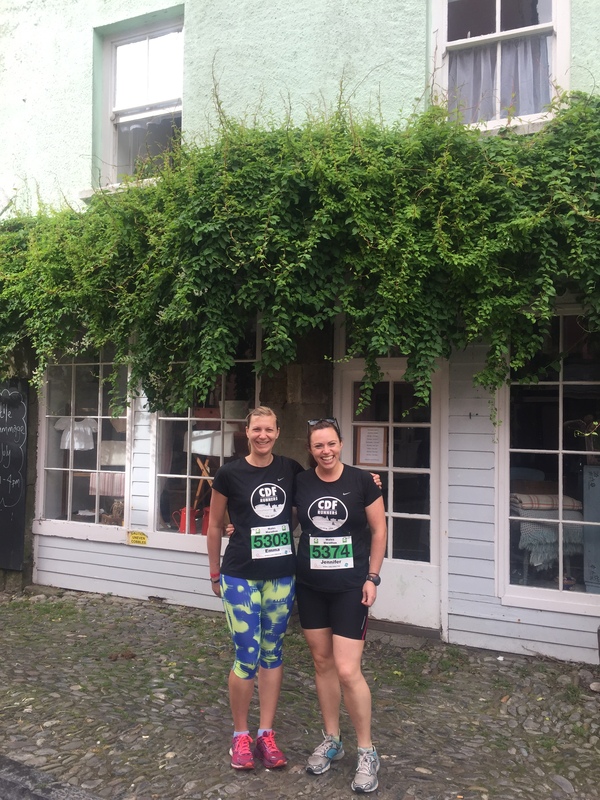 On the first nervous loo trip, we bumped into my fellow CDF club mate Jenny, and her friend Craig, who were both also running the full marathon. We carried onto the bag drop together, where we made our final preparations, fixing gear, applying sunscreen, tying and re-tying shoelaces, sorting gels. Enterprising Craig had a gel belt made by his mum the night before out of an old pair of his underwear. I’ve heard of marathon runners and their lucky undies but this was a new level! We wandered down towards the start, and after another nervous loo break and a quick picture at the start line, I kissed Simon and Joshua goodbye and we headed onto the red carpet into the start pen. I imagined running back down this carpet, victorious, in a few hours time! Soon it was announced the 5km race, which started 5 minutes before us, was off. A quick hug with everyone, then suddenly the pen was moving and we were off! Jenny and Craig were aiming for much quicker times than me and quickly disappeared into the crowd. Butterflies in my stomach, I tried to concentrate on my breathing and arm movements and not go out too quickly. 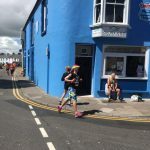 After the first couple of kilometres, I started to hit my stride, and saw my fellow CDFer Ruth on her way back into Tenby on the 5km route – we exchanged big smiles – I was feeling good! Crowds lined the streets all the way out of town, cheering us on. The atmosphere was fantastic. Just out of Tenby, we hit our first proper hill. My feet felt surprisingly light as I carried on up, some people were walking already though?! Didn’t they know this was a race? The next few miles I carried on at my nice easy pace. Contrary to the forecast it was starting to heat up and the humidity was becoming quite oppressive, my shirt was already soaked through with sweat. Every now and then the sun would break through the clouds giving us a taste of how hot it was going to get. Having read the course information beforehand, I decided to hang back and watch how it all worked at the first drinks station. 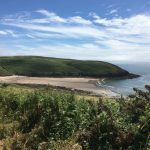 Because the course is set within the boundaries of the Pembrokeshire National Park, there are quite strict rules relating to drinks and fuel stations, which lie inside a 20 metre long ‘eco zone’. You drink and refuel in the eco zone and drop your cups/wrappers in the zone. Any contestant caught dropping items outside the eco zone faces disqualification! A great idea in theory to keep the countryside tidy, but in practice, over 900 thirsty athletes arriving at the first 20 metre long zone is quite a different thing! I know what you’re all thinking too – I can’t finish a drink in twenty metres! You’re right, you can’t! So everyone stops and falls over each other, and its generally just chaos. I observed all this as I passed through, sticking with my water bottle I was carrying in my belt at this point. Fortunately, by the time I reached the second station the field had thinned out a bit and things were less chaotic. It continued to get warmer as we rose up and dipped down across the countryside. 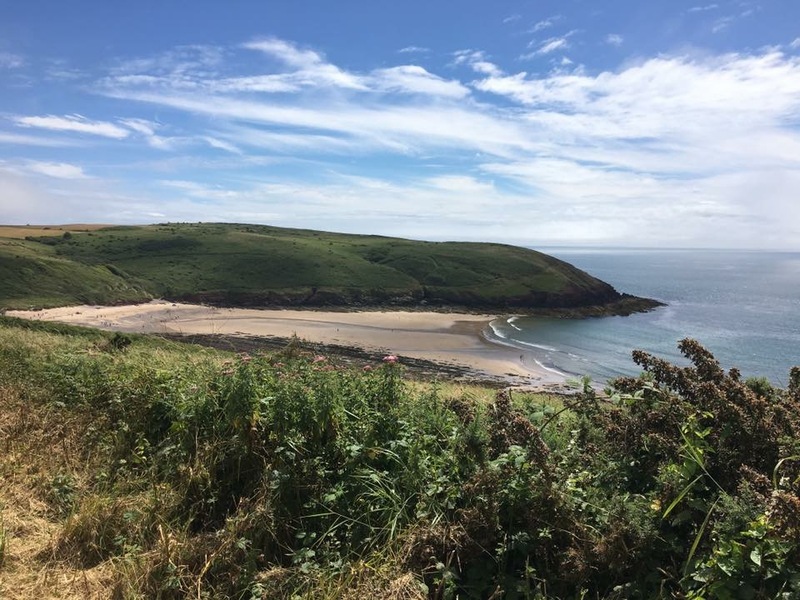 The sun kept breaking through the clouds too – I heard a competitor opine behind me in a thick northern accent: “You come all the way to Wales, and the bloody sun shines!” It doesn’t seem to matter what we do in Wales, people are always disappointed by the weather! There were some amazing views to be had, I would have loved to take a few photos, particularly of a bunch of friendly cows watching us over the fence as we all ran by. The mile markers ticked on and I was feeling good.  Just after the ten mile marker I suddenly heard my name being called – not entirely unusual as your name is on your bib, but this time I knew the caller: former CDF coach and Ironman triathlete Jon Harrhy, cheering me on! I was super happy to see a familiar face! Coming down into Pembroke we went a bit off-road, but soon came around to the castle. Another water/feed station and I grabbed a cup proffered to me by a small child and took a gulp – not water, ergh, some kind of awful energy drink! Rinsing the taste out with my water I carried on uphill again, through the confetti left by the half marathon start, who’d departed shortly before. Coming up to the thirteen mile mark I checked my watch – 2.13, I was happy with that! Running through Pembroke, people lined the street in front of their houses, cheering and offering jelly babies. Quite a few people had their sprinklers or hoses on, directed out into the road. It was now very warm and extremely humid. One man stood out in the centre of the road spraying people with his weed sprayer. I gave him a wide berth, not entirely convinced he might not have had Roundup in the thing the week before! It was after 12 now and the sun had completely broken through the earlier cloud. I silently cursed all the Pembrokeshire farmers for keeping their hedges so well-trimmed that there were rarely trees for shade! I noticed my pace had slowed a bit but told myself not to worry, just go with it. Then, around the mile 15 marker, I started feeling really not so good. Surely it wasn’t The Wall already? In training this had never happened until around mile 20! But it was. In fact it was worse. I felt dizzy and could see funny little light spots moving around the corner of my vision, still I kept going but the dizziness got worse. The sun got hotter, and the hills seemed to get steeper. By this point I was the only person around me still running up the hills. Everyone else around me was walking. I debated internally what to do…I had never walked in a race in my life! It felt like copping out! But I decided that I too should walk for a bit, just till the dizziness stopped. Luckily it did, but not entirely. The next five miles are a bit of a blur as I egged myself on and on and on…just run this kilometre, then you can walk a bit/have another Clif block/have some more water etc etc. Three times an ambulance bike whizzed past me, sirens blaring. Other people were finding this hard too, it could be worse. What I wanted to do was stop and have a big cry about how unfair it all was. I debated that for a kilometre or so, but sensibly decided it would use up too much energy. I can’t do this though surely? It’s so so hot. How is anyone still running? All the fast people will be finished by now, that’s the key to this, run so fast you beat the sun! My mood went up and down. Just carry on. I feel so sick. Could I just stop? Just for a bit? No, not a good idea, I’ll never get going again. I tried to think of good things like the food I would eat (but wasn’t much feeling like food) and how I would spot Simon and Joshua waiting for me in the crowd, and how awesome it would feel to run up that red carpet I’d been on a few hours earlier. At another point I saw an ambulance parked in a lay by and considered just going over and handing myself in! But then I couldn’t face the thought of going back to run club and having to tell everyone I couldn’t do it. No, I could do it. I remembered one of my last texts from my Dad in New Zealand, “just a few hills, but nothing a Taranaki girl can’t handle”. That’s right! I’m a Taranaki girl – I eat hills for breakfast! At one particularly tough point, slogging it out uphill in what felt like my fastest power walk (but was probably actually just a regular walk), I turned to the guy next to me and said, voice breaking, “This is so tough isn’t it?” He must have heard the despair because he said, “Yeah, but we’re doing it aren’t we?” “Yeah, I said, I don’t know how, but we are!” I can’t even imagine what it must have been like for the people who had cycles 118 miles the day before, and swam 2.4 miles the day before that. They are made of tougher stuff than me for sure! Somehow, I made it to mile 20 with an odd feeling…I was feeling a little better. There was a water station and what a view!! Manorbier Bay stretched out in front of me glinting in the sunlight. How desperately I wanted to just jump in for a swim! Now only 6.2 miles to go…that’s not that much right? 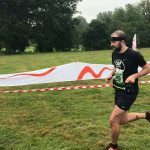 Two parkruns and a bit! Only two! We carried on to Manorbier. There was a particularly hideous hill through the centre of the village and I had to walk again, I could hear lots of people calling my name, encouraging me on. I remember thinking I must look really bad because everyone is being so nice! 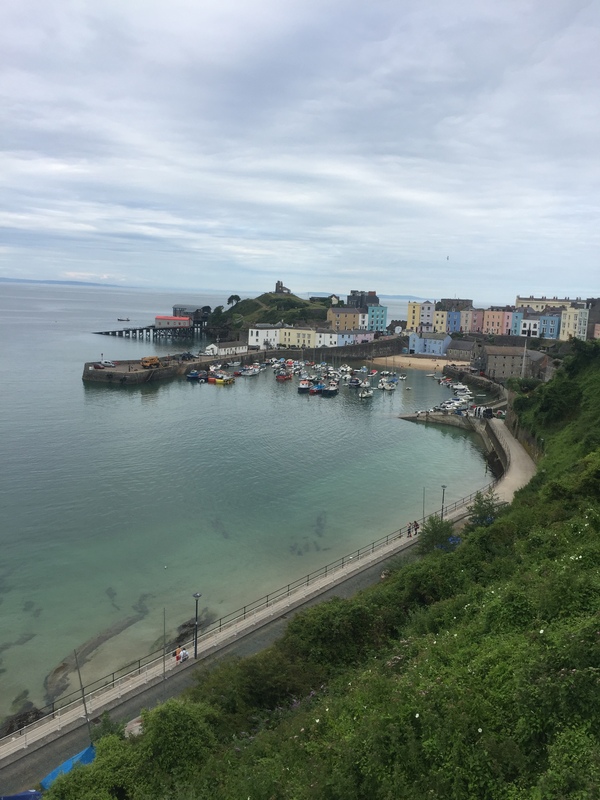 With the thought of deep-fried foods and cool drinks firmly in our heads, we carried on towards Tenby. I was in uncharted territory now – my training peaked at 22 miles. But I was starting to feel like maybe I could do this. I recognised we were back on the same road we went out on. I’m not sure whether at this point being back in familiar territory was making me feel better or worse though. I slowed to a walking point again just near the leisure centre, trying to ready myself for what I knew was to come, the last hill coming back into town. I would like to say I bravely ran the whole way up it as the crowds cheered me on, but I didn’t. The crowds did cheer me on anyway though! Reaching the top I started to run again and then at the corner by the 26 mile marker I saw Simon and Joshua waiting for me! My boys! What a boost! I picked up the pace now – that red carpet – I was nearly there! Unfortunately, my memory didn’t serve me too well as to how far away the red carpet actually was and I had to back off the speed a bit! Then I hit the carpet and my ears were filled with the cheering of the crowds all along Tudor Square! There was the finish, no wait, that’s there start, there is the finish! I made it! I am a marathon runner! I collected some water and greedily gulped it down, no longer limiting my stomach to tiny sips. Collected my medal and passed by the huge containers of food laid out for us all, I had no appetite at all but knew I should eat something so nibbled a bit of flapjack gingerly. Then I was out another side street and Simon and Joshua were there waiting for me, telling me how proud they were. I had finished – 4hrs 49 minutes. I am a marathon runner. And what a marathon it was.